Insufficient testing or unqualified testers are frequently the root causes of poor quality software. In fact, the systematic use of solid test techniques is the exception rather than the rule in practical applications. The objective of the ISTQB® Certified Tester Program is to change this. All important testing topics are explained and simulated for training purposes. ISTQB® Certified Tester is a globally homogeneous program, and can be considered the benchmark for software testing certification. Hundreds of experts from more than 40 countries are continuously updating this program. Thanks to this close cooperation, international compatibility is always achieved. As a result, it is also possible to obtain certification as an ISTQB® Certified Tester in a wide variety of languages. At this time, GASQ offers certification at the Foundation Level in English, French, German, Polish and Russian. More than 500,000 software testers are now in possession of an ISTQB compliant certification – and the number continues to grow every day. The ISTQB® Certified Tester Program provides participants with the knowledge they need to test software effectively. Our program comprises three levels: Foundation Level, Advanced Level and Expert Level. The Foundation Level syllabus includes the following sections: The Fundamentals of Software Testing, Testing During the Product Lifecycle, Dynamic Testing, Static Testing, Test Management, and Testing Tools. Target group: The foundational level of the Certified Tester training program aims at all individuals who are involved in software testing activities of any kind. This includes individuals holding positions as testers, test analysts, testing engineers, testing consultants, test managers, acceptance testers and software developers. The foundation level also addresses the needs of individuals holding positions such as project manager, quality manager, software development manager, system analytics specialist (business analysts), IT managers or management consultants who are eager to acquire basic knowledge and a fundamental understanding of software testing applications. Validity Once achieved, the ISTQB Certified Tester Foundation Level certification does not expire. There are no formal prerequisites for certification. Nevertheless, we recommend participation in a training program offered by an ISTQB accredited training provider prior to taking the exam. In order to acquire the title of ISTQB Certified Tester you simply have to pass the Foundation Level exam. Please download the current Foundation Level syllabus here. Agile testing is a relatively new approach to software testing that follows the principles of agile software development as outlined in the Agile Manifesto. A tester on an Agile project will work differently than one working on a traditional project. Testers must understand the values and principles that underpin Agile projects, and how testers are an integral part of a whole-team approach together with developers and business representatives. There is a lot of confusion concerning agile testing – which means there’s an educational opportunity as well. The Agile Tester certification will give the tester the knowledge to be a high-performing member of agile testing teams. Validity Once achieved, the ISTQB Agile Tester certification does not expire. Certification prerequisite is ISTQB Foundation Level certificate. Please download the current Agile Tester syllabus here. Model-based testing is a concept that focuses on the software testing that generates from models that are abstract and represent a certain function or expected behavior of the system. This approach views software testing as an integral part of software development, which makes it both challenging and extremely beneficial for IT businesses. Model-Based Tester module provides the professional testers with additional knowledge and skills in the area of model-based testing process, methodology and techniques. This qualification would be useful not only for software testing specialists, like software testers, test analysts, technical test analysts and test managers, but also for anyone who wants to understand the use of models for test generations. Validity Once achieved, the ISTQB Model-Based Tester certification does not expire. You can download the current Model-Based Tester syllabus here. Automotive Software Tester Module is mostly directed on professional software testers who have mastered the fundamentals of testing and want to devote their carreer to automotive branch. The certification can also be useful for test analysts, test engineers, test managers, software developers, as well as anyone who would like to learn more about software testing in automotive projects. Validity Once achieved, the ISTQB Automotive Software Tester certification does not expire. Obtain a general understanding of the standards relevant for the automotive branch, such as Automotive SPICE®, ISO 26262, etc. You can download the current Automotive Software Tester syllabus here. 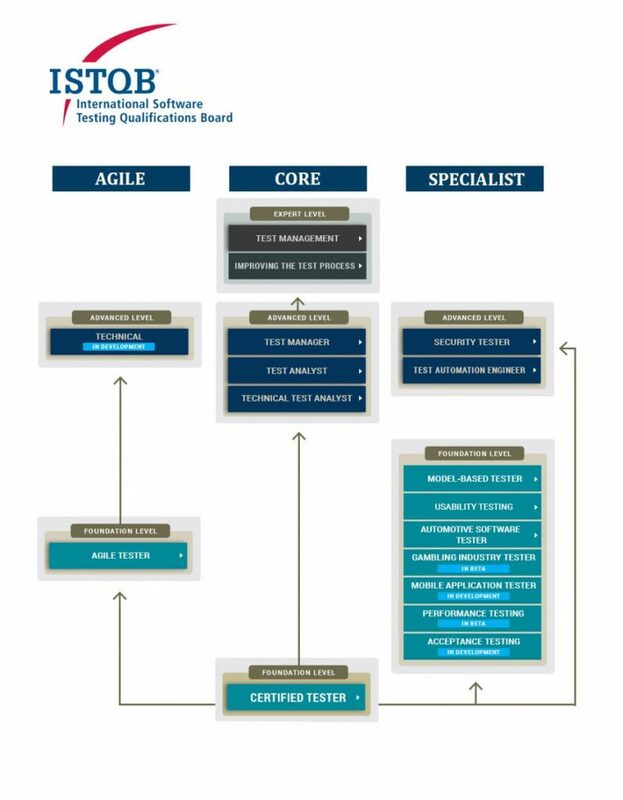 The ISTQB Performance Tester qualification is aimed at anyone involved in software testing who wishes to broaden their knowledge of performance testing or anyone who wishes to start a specialist career in performance testing. The qualification is also aimed at anyone involved in performance engineering who wishes to gain a better understanding of performance testing. Performance Testing Certification: Improve your software performance testing – and your career. Once achieved, the certification does not expire. Please download the Performance Tester syllabus here.